Those who are quietly eating breakfast at the Bridgeport McDonalds each morning may be totally unaware that they are among greatness. At a table with his friends, Roger Hartley can be seen on any given day discussing the latest news, laughing, and just hanging out. What is not obvious at first sight is that he is a proud Vietnam War Veteran and that he is among the best of the best when it comes to all things aviation. On December 29, Hartley was awarded the Charles Taylor Master Mechanic Award for his 50 years of aviation service. The award is named after the first aviation mechanic in powered flight, who was the mechanic for the Wright Brothers. In an ironic twist of fate, Hartley actually worked on Charles Taylor’s grandson’s airplane during his prestigious career. He also had the opportunity to work on an airplane that now hangs in the Smithsonian. Hartley moved to Bridgeport in 1971. In his 50 years of aviation service, he has received his FAA Airframe and Power Plant Certification, his Inspection Authorization, his pilot’s license, and served as Maintenance Team Leader and Flight Engineer while stationed with the Army in Vietnam. Even before he sees an aircraft, Hartley can hear and identify the type and what, if anything, is wrong with it. His passion for aviation is contagious and his own brothers and son have also been involved with aviation careers. Among those in the industry, Hartley is considered among the best when it comes to maintaining and ensuring safety of those flying in personal aircraft. As a Charles Taylor Master Mechanic Award recipient, Hartley is in good company. Since the award’s inception, there have only been eight recipients in West Virginia and Hartley is the third from Bridgeport. In order to receive the award, those nominated must hold a U.S. Civil Aviation Authority or FAA mechanic or repairman certificate. They must have 50 or more years of civil and military maintenance experience and be a U.S. citizen. 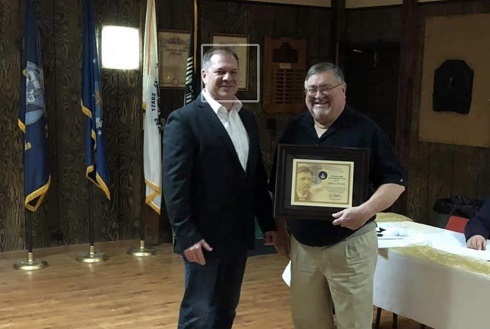 Friends and family members gathered at the American Legion Post 68 in Bridgeport on December 29 for a celebration honoring Hartley. The FAA presented him with the Charles Taylor Master Mechanic Award and, to this day, pride beams on the faces of those who know him well.